The Montgomery C. Smith School Drama Club and Columbia County Youth Theater, Inc. present, “The Magic Tree House: Pirates Past Noon Kids.” The magic begins at 7 p.m. on Friday, May 11, 2018, in the MCSIS auditorium (102 Harry Howard Ave, Hudson). The performance is open to the public and admission is free. Hudson in Hudson! Local celebrity Hudson the Railroad Puppy and his dad, Richard Nash, came to M.C. Smith Intermediate School. The students learned about Hudson and his "magic paw" before his visit. Mr. Nash answered any questions the students asked. They got so many pets and licks from Hudson! Even students that were uneasy about dogs ended up petting him by the end of his visit! UPDATE (11/8/2017): Due to the volume of children participating this year, the CMH Dental Van is extending its time at JLE through November 21. The van will relocate to MCSIS on either November 21 or November 27 (instead of November 14, as originally planned). Students and staff at the Hudson City School District donated more than 1,000 pounds of pet food to local organizations during the holiday season. M.C. Smith Intermediate School added pet food to its annual Stuff the Bus event this year, and students who collected the most donations got to deliver the items in person to Out of the Pits and Animal Kind. The human food donations were brought to the Catholic Charities food pantry. The HCSD Transportation Department also contributed mass quantities of pet food and monetary donations for Animal Kind and the Columbia-Greene Humane Society. See more photos of the kids delivering donations on our Facebook page. Third grade students decided to participate in a civic-minded project called “Chores for Change” after reading books on children’s rights, sustainability, water accessibility and educational differences of children in various communities around the world. The students persuaded their parents to allow them to earn money for doing household chores. To date, they have earned more than $100 to put toward a clean water well project or purchase a goat for families in Africa. The project will continue through the spring. The Hudson Intermediate School, through the Community Schools Grant, is able to offer After School Instructional Services to all of our students. The program will be offered after school on Monday, Tuesday, Thursday or Friday until 3:45 p.m., beginning immediately and running through the end of the school year in June. Please let us know if your son/daughter will be able to attend by returning this form to MCSIS. If you respond yes, we will contact you with a starting date and the name of the teacher they will be working with. Students will be chosen on a first come, first serve basis. Please call if you have any questions (518-828-4360, Ext. 1112). The annual Turkey Trot at MCSIS was on November 18, 2016 and more than 20 frozen turkeys were awarded to students in grades 3-5. Each turkey weighed more than 22 pounds! On Tuesday, September 20, 2016, we invited fathers (and stepfathers, grandfathers, brothers, uncles, etc.!) to our annual "Dads Take Your Child to School" breakfast event. Thank you to all the male caregivers for being involved! Here is a letter sent home to parents about the NYS assessments in math and ELA that will take place in April. The letter explains how the district uses the test results to improve education for students and the changes to help address concerns of parents and educators. A high-profile performance that spotlights a Civil Rights story came to M.C. Smith Intermediate School! Ally Sheedy, perhaps best known for her roles in "The Breakfast Club" and "Psych," is directing a one-woman performance based on the 2015 memoir, “Turning 15 on the Road to Freedom: My Story of the 1965 Selma Voting Rights March” by Lynda Blackmon Lowery. For more information, read this article from the Albany Times Union. Students at the Intermediate School brought donations to Catholic Charities and the Columbia Greene Humane Society this week. The 15 kids who donated the most food helped Mrs. Ordway's class load and unload the donations! Thank you to MSJ Bus Company for generously donating the bus. On September 22, 2015 over 350 people participated in M.C. 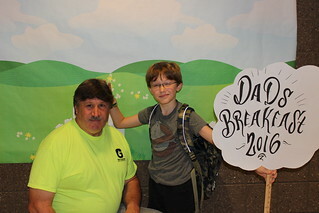 Smith Intermediate School’s third annual Dads Take Your Child to School Day.The event began at 7:15 a.m. in the cafeteria with a light breakfast and refreshments. Dads Take Your Child to School (DTYCTS) is a campaign to promote father involvement by encouraging fathers, stepfathers, foster fathers, grandfathers, uncles, brothers, godfathers, and other significant male caregivers to take their children to school or Head Start in September and remain involved throughout the year. Major League Baseball has donated 250 Mets tickets to the Montgomery C. Smith Intermediate School! Students who won the Principal’s Award in the first and second trimesters, as well as members of the Hatch Afterschool Program, will be heading to Citi Field on Wednesday, May 27 to see the Mets play against the Phillies. Thank you to Major League Baseball and the Commissioner of Baseball for this donation! On April 23, students in the Afterschool Program visited the Daughters of the American Revolution to see the Lincoln Funeral Train exhibit with Mrs. Clark and Mrs. Dolan. In late April, Hudson honors the 150th anniversary of the death of Abraham Lincoln and his subsequent trip back to Illinois on the Hudson River RR, passing through towns with tracks bordering the Hudson River. Check out the 2014-15 Winter Edition of M.C. Smith's "Smith Spotlight," a magazine that was launched last year "by the students, for the students." This edition uses mathematical averages to show which AmeriCorps members are the best at Chubby Bunny, which teachers are the most fashionable, and which activities are most favored by students. Read it here! The Hudson Intermediate School through the Community Schools Grant is able to offer After School Instructional Services to all of our students. The program will be offered on Monday, Tuesday, Thursday or Friday until 3:45. If they are a participant in the afterschool program, they can just walk there when done. If they do not attend the afterschool program, they will need to be picked up at the front door of the school at 3:45. Please let us know if your son/daughter will be attending by returning the slip below. If you respond yes, we will contact you with a starting date and the name of the teacher they will be working with. Please call if you have any questions. Click here for the form to fill out. Mrs. Parmentier's and Mrs. Semanick's classes are participating in a pilot program to integrate the use of Google Chromebooks into education! Mrs. Parmentier's class kicked off the day with StarWalk, an online library where students can choose from fiction and non-fiction books that are aligned with the Common Core. Then they initiated their Google Classroom lesson which walked students through writing and math assignments at their own paces while Mrs. Parmentier walked around to provide support to students. Mrs. Semanick's class did a "web quest" on author Rick Riordan's website.